Each volume includes at least 10 studies in the klezmer style with mp3 backtrack. 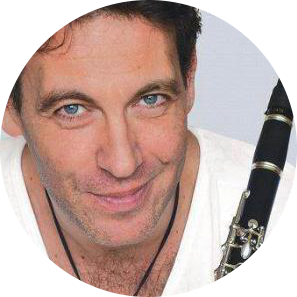 All studies were composed by Samuel Berthod, clarinettist and specialist in klezmer.. The studies are crafted to push you to the top with the help of a good pedagogy. On the right, choose the study of your choice. to pay through PayPal, and your download link will be displayed. The pdf is in french. This volume include 10 studies for beginner clarinetists. Each study comes with a mp3 backtrack. This volume include 10 studies for clarinetists. Each study comes with a backtrack. A duo is added as bonus. This volume include 10 studies for advanced clarinetists. Are you sensitive to new repertoires ? which will surprise your audience. It's a fun way to end your concert ! Listen to a extract below or download for free an extract of the score. Five short stories in klezmer style, exploring in an unique way the warm sound of the bass clarinet. A new musical flavor, each piece named by a Jewish tradionnal meal ! Each duo comes with a mp3.